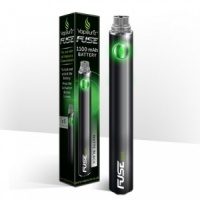 Vapouriz FUSE 1100 mAh Electronic Cigarette Battery. TIP: mAh = The higher the number, the longer the e-cig battery will last in between charges as the battery has a larger capacity. To avoid the battery overheating only charge for 2-3 hours maximum. Do not leave the battery on charge overnight or unattended. I have only been vaping for the last 4 months, but did try to start a good few years ago, and started with the Vapouriz, so have continued with this same make.I have had this battery bfore, and re purchased owing to the fact I left the whole thing on a bus! There are cheaper makes of this specific battery, but decided to go with this make, as they say it is better the devil you know! 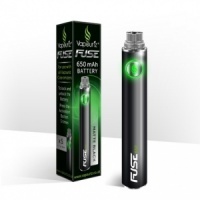 This does appear to be good in quality and Puff Daddie supply good quality in their service, I shall continue with the vaping, and I doubt if I will go onto the 'BIG' one! I can't recommend Puff Daddie enough. While it can be cumbersome to login (always rejects password so have to reset), the service is out of this world. Within a day of ordering, the product is delivered within 2 days. Certainly on par with Amazon and the product is always as stated. Bravo Puff Daddie - you have a customer for life if you continue to trade like this. Have ordered a variety of products and never been disappointed..Excellent service and very quick delivery.. Absolutely excellent service from puffdaddie - very quick to process and despatch the orders and the products are far cheaper than on comparable sites. Items are the same as on the brand name sites but at a more reasonable price. So glad I found this site - its now on my favourites! Service & delivery was excellent too. Lasts at least 2 days on one charge. Good buy!